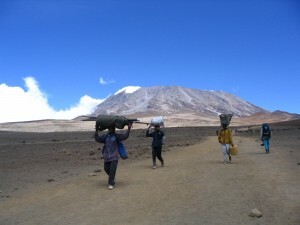 The Rongai route is the only trail to approach Mt Kilimanjaro from the North, on the Kenyan side of the mountain. The Rongai route is considered more scenic than the Marangu route, easier than the Machame route and has a high summit success rate. The Rongai route is also one of the quietest routes as it does not converge with any other route until it joins the Marangu for the ascent on the summit. Descent is again via the Marangu route on the southeast side of the mountain. This route is best done in 6 days allowing for good acclimatisation. After breakfast transfer through villages and coffee plantations for 3 hours to the attractive wooden village of Nale Muru. After signing in and preparing the porters, you begin the hike on a wide path winding through fields of maize and potatoes, then enter pine forest. You then start to climb gently but consistently through attractive forest that shelters a variety of wildlife. The forest begins to thin and Simba Camp (2,600m) is near the “First Cave” at the edge of the moorland zone with extensive views over the Kenyan plains. 3 – 4 hours walk. Day 2: Simba camp – Kikelewa Camp (3,600M). About 3-4 hours trek through the heather will bring you to second caves. If the weather is clear, Mawenzi will be in plain view; a stunning sight. Enjoy stopping to see the exotic heather-zone flowers and plants which grow alongside the trail. A smaller track leads off the main trail through the moorland and towards Mawenzi. The trekking time is about 6-7 hours. The camp is surrounded by a landscape of bizarre plants and rock formations and caves. Day 3: Kikelewa camp – Mawenzi Camp (4,330M). Trek from the moorland and eventually into the stark highland desert towards Mawenzi, on trails not frequented by many tourists. From the Tarn Campsite you will enjoy a magnificent view of Mawenzi, with it’s steeply rising rock spires. Total trekking time is 5-6 hours. Day 4: Mawenzi Camp – School Camp (4,700M). 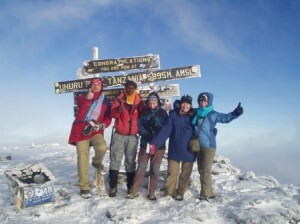 The trekking time today is 5 – 7 hours, though a relatively easy hike across the wide saddle between Mawenzi and Kibo. The trek takes you across the massive saddle- the crossing is impressive and the landscape spectacularly stark. An early night is recommended as you’re attempting the summit from Mid night. Kick off is at midnight for your summit attempt. The goal is to climb before dawn so that you can reach Uhuru Peak shortly after sunrise. Leave at 1 AM, switchback up steep scree or possibly snow, and reach Gilman’s Point on the crater rim at 5,861 m between 5 and 6 AM. Here, views of the fabled crater and its icecaps greets you. Another 2 hours of hiking along the crater rim takes you to Kilimanjaro’s true summit, Uhuru Peak. This is Africa’s highest point. After your summit stay, descend back to the camp, have lunch, rest, and descend cross the saddle to the Horombo Hut.NB: You’ll start this climb in the dark with headlamps or flashlights. It will be very cold until you start descending, so you will need all of your warm layers. This is, by far, the most difficult part of the trek. Slowly slowly, or, “pole pole,” and an optimistic attitude will get you there! A steady descent takes you down through moorland to Mandara Hut (2,700m. ), the first stopping place at the Marangu route. We then continue descending through lovely lush forest on a good path to the National Park gate at Marangu (1,830 m.). [5-6 hours walking. You will be transferred to the Hotel in Moshi for overnight. Make the ascent in a pace that suits you do not rush and rest frequently. Make Sure that you drink at least 3 – 4 liters of liquid a day, preferably water. The water on the mountain is safe to drink. Take a sip every now and then. You will lose a large amount of fluid through the lungs and by sweating. Transfer by bus shuttle Nairobi-Arusha- Moshi-Nairobi.